D day has come and gone!We are now heading into uncharted territory-aka week 40 and beyond! Yesterday I went to the hospital for my weekly appointment. I brought the Frenchman along with me as well as my hospital bag-I don’t know what I was expecting to happen, that my waters would break as soon as I went through the doors to the maternity unit; as if Mini Mini would suddenly realise, hey, it’s my due date, here I come! In any event, this was not what happened and the appointment was as routine as all the ones that came before it. The only difference being that instead of attending the midwives clinic as I have been doing since getting the all clear at my 20 week scan, I had to see the doctor as I had surpassed my due date, which meant waiting for hours! I much prefer seeing the midwives-they are so much quicker and a lot more thorough, both in their examinations and dissemination of info. They happily dispense information while you have to remember to ask the doctor everything and even then you don’t always get a straight answer from them. So after the usual urine,blood pressure checks,it was time to be hooked up to a trace machine to monitor baby’s heart rate and movements as I d noticed she’s been a little quiet of late. She really woke up though when the cold gel was administered to my belly and the doctor was very happy with the results of the trace which is great news. Then it was on to the internal sweep, where the doctor swept her finger around the neck of the cervix to try and separate the membranes of the amniotic sac surrounding baby from my cervix. This separation releases hormones (prostaglandins) which in turn should kick start labour. It was more painful than I thought it would be-from reading up about it on line, it shouldn’t really hurt but tend to be more on the uncomfortable side,which again does not bode well for when things finally start to get going. I honestly don’t know how I gave birth previously without any pain relief. I seriously doubt it’ll be the same second time around. And then that was it. We were out the door with an induction date-next Friday 29th and a charming leaflet all about the procedure itself-I will spare you the gory details of this and hopefully will never have to write about a procedure that includes the use of an implement called an amnioHOOK. Since the sweep, I’ve been having more period like pains and a good bit of spotting-all normal but seem to be getting less contractions since I was getting before. I am all but resigned to being induced but will be praying it doesn’t come to that, although it would be the ultimate sod’s law-induction can take up to 2 days, which would bring us up to the 1st December for Mini Mini’s arrival and what day is the Frenchman due back to work?The 2nd!! 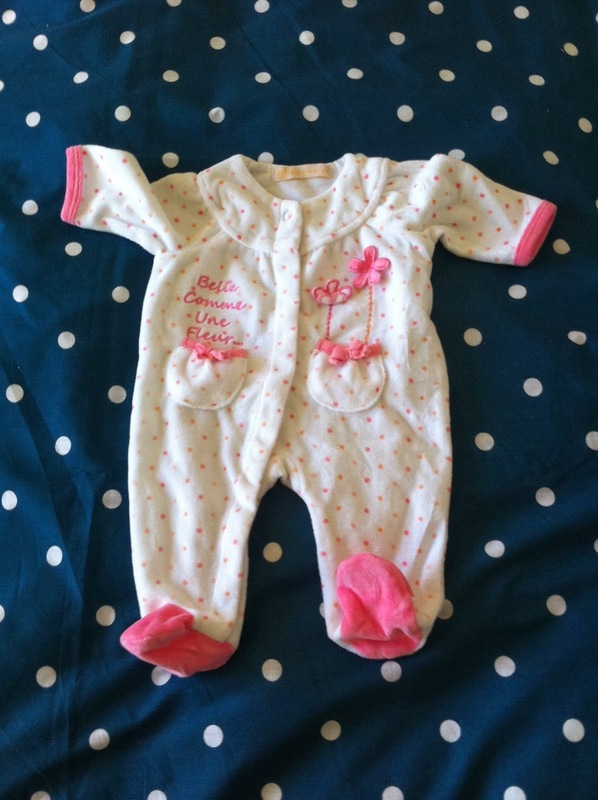 Hurry up Mini Mini or you’ll be too big for the lovely French newborn clothes! Come on, Mini Mini! We're all waiting! Thanks-fingers and everything else crossed!